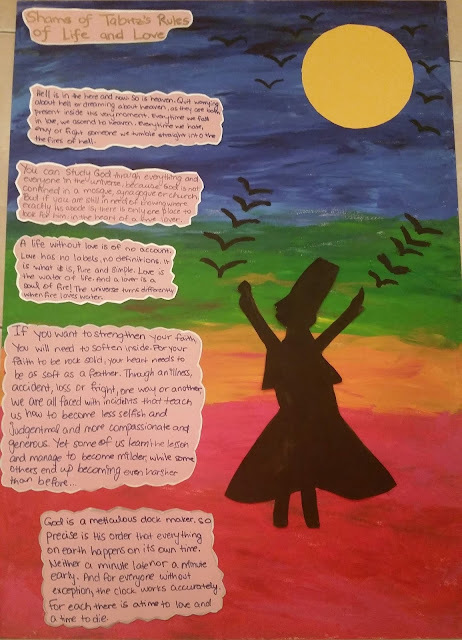 While doing this art project, what inspired me the most was my love and appreciation for the mystical side of Islam: Sufism. I have read a book called The Forty Rules of Love by Elif Shafak, last summer. This book brought Sufism into my life for the first time, and it definitely added a touch of beauty and a new kind of love to my life. The story features Jalaluddin Rumi the well-known Sufi mystic and his companion Shams of Tabriz, and it takes us in a journey led by Shams and through a narrative he tells us the forty rules of love and life that are in essence Sufi teachings of how to live this life and love God. Sufism is purity. Sufism is unity. The unity of all that surrounds us and all of which is within us. I chose Sufism because it’s a side of Islam, which should be explored and understood more, and I believe that if people understand it whatever their religion or beliefs are they will fall in love with Islam, and understand it. Islam is a religion of peace and love. I hope many can understand this message. I hope people understand what Islam is really about. I hope a beard and a veil do not terrify non-Muslims. And I hope everyone would fall in love with Sufism just like I did. And just like Jelaluddin Rumi once said, “Out beyond ideas of wrongdoing and right doing, there is a field. I’ll meet you there.” We have to give the other a chance, understand them and give them the freedom to believe in whatever it is they want to believe in.